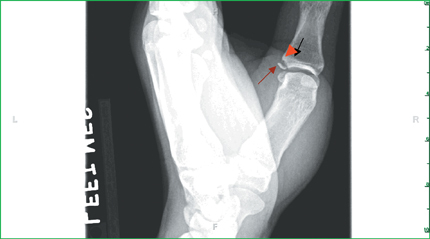 AP and lateral radiographs showed a fracture at the base of the proximal phalanx of the thumb (Figure 1). A small osseous fragment was noted on the ulnar side of the first metacarpophalangeal (MCP) joint (Figure 2). 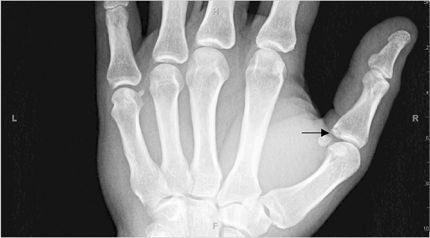 A concave defect was noted in the base of the proximal phalanx of the thumb, consistent with a “donor site.” This location is the attachment site of the ulnar collateral ligament, one of the 2 collateral ligaments of the first MCP joint. Gamekeeper’s thumb is a common injury and is used to describe an acute or chronic injury of the ulnar collateral ligament of the first metacarpophalangeal joint. The term was initially used to describe chronic occupational injuries to the ulnar collateral ligament to gamekeepers in Scotland because of their methods used to kill rabbits.1 The injury occurred in gamekeepers as they sacrificed rabbits by breaking their necks with their thumbs and index fingers. Acute injuries now tend to be more common among skiers and may constitute up to 50% of hand injuries in these athletes. It may also be seen in patients with rheumatoid arthritis and suffering from a motor vehicle accident and other sports injuries resulting from a fall onto an outstretched hand with an abducted thumb. The ulnar collateral ligament is a short ligament that originates from the metacarpal head and inserts onto the medial aspect and base of the proximal phalanx of the thumb. The MCP joint chiefly provides flexion and extension movements. Stability to the joint during activity is provided primarily by the intrinsic and extrinsic muscles of the thumb. The proper collateral ligament, the accessory collateral ligament, the palmar plate, and, to some extent, the dorsal capsule also help to stabilize the MCP joint. The adductors of the thumb insert onto the extensor expansion through its aponeurosis, which lies superficial to the ulnar collateral ligament. Most injuries of the thumb are ligamentous injuries, usually involving an avulsion of the ulnar collateral ligament from the base of the proximal phalanx. The mechanism of the injury involves an acute valgus stress on the MCP joint during a fall on an outstretched hand.Occasionally, an avulsion of the bone at the base of the proximal phalanx may result in a gamekeeper’s fracture. The UCL no longer contacts its area of insertion and due to the interposition of the aponeurosis between the proximal and distal ends of the torn ligament, healing in these lesions can be impaired. These lesions are initially treated conservatively for 6 weeks. If instability still persists despite conservative treatment, surgery is undertaken. However, if surgery is undertaken 3 weeks after the initial injury, intervention is more difficult and the results are suboptimal.10 Complete tears repaired after 3 weeks tend to have an increased incidence of weakness and pain on pinch grasp. For this reason, early surgical intervention is generally undertaken for all cases of ruptured ulnar collateral ligaments. Gamekeeper’s thumb is a common skiing injury. Early and accurate diagnosis of this injury and its complications can result in better patient outcomes and decreased long-term morbidity. Campbell CS. Gamekeeper’s thumb. J Bone Joint Surgery. 1955;37-B:148-149. Hannibal M. Orthopedic surgery for gamekeeper’s thumb. Coauthor(s): Roger D. Medscape. http://emedicine.medscape.com/article/1239413-overview#a0103. 2004. Posner MA, Retailaud J. Metacarpophalangeal joint injuries of the thumb. Hand Clinics. 1992;8:713-732. Hinke DH, Erickson SJ, Chamoy L, Timins ME. Ulnar collateral ligament of the thumb: MR findings in cadavers, volunteers, and patients with ligamentous injury (gamekeeper’s thumb), AJR Am J Roentgenol. 163:1431-1434. Stener B. Displacement of the ruptured ulnar collateral ligament at the metacarpophalangeal joint of the thumb. J Bone Surg. 1977;59-A: 519-524. Downey EF Jr, Curtis DJ. Patient-induced stress test of the first metacarpophalangeal joint: A radiographic assessment of collateral ligament injuries. Radiology.1986;158:679-683. Resnick D, Danzig LA. Arthrographic evaluation of injuries of the first metacarpophalangeal joint: gamekeeper’s thumb. AJR Am J of Roentgenol. 1976:126:1046-1052. Stener B, Stener I. Shearing fractures associated with rupture of the ulnar collateral ligament of the metacarpophalangeal joint of thumb. Injury. 1969;1:12-16. Stener B. Skeletal injuries associated with rupture of the ulnar collateral ligament of the metacarpophalangeal joint of the thumb. Acta Chir Scand. 1963;125:583-586. Arnold DM, Cooney W, Wood M. Surgical management of chronic ulnar collateral ligament insufficiency of the thumb metacarpophalangeal joint. Orthopedic Review. 1992;21;583-588. Louis DS, Buckwaller KA. Magnetic resonanace imaging of the collateral ligaments of the thumb. J of Hand Surg (Am). 1989;14A:739-741. Spaeth JA, Abrams RA, Bock GW, et al. Gamekeeper’s thumb: Differentiation of non-displaced and displaced tears of the ulnar collateral ligament with MR imaging. Radiology. 1993;188:553-556. Ebrahim Farhad S, Maeseneer Michel De, Jager Tjeerd, et al. US diagnosis of UCL tears of the thumb and Stener lesions: Technique, pattern-based approach, and differential diagnosis. Radiographics. 2006; 26:1007-1020. Gamekeeper’s thumb (Skier’s thumb). Appl Radiol.